Search My Ancestry: Ideas for Christmas From Your Ancestors - 9 - Decorate Your Doorway! Ideas for Christmas From Your Ancestors - 9 - Decorate Your Doorway! ‘Downstairs young hands are decking mantles, shelf and doorway with evergreens, and nimble fingers are twisting and twining the berried holly into a crown -a crown for the [New Year],’ Dundee Evening Telegraph, 31st December 1889. 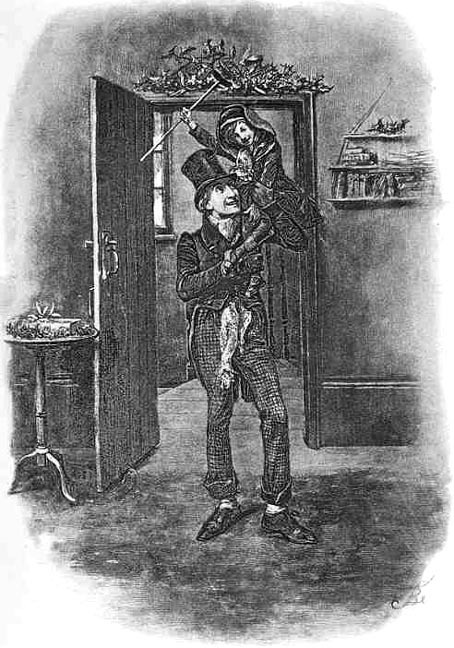 'Bob Cratchit and Tiny Tim' by Fred Barnard. 1870s photogravure. Frontispiece, Dickens's A Christmas Carol. Wikimedia Commons.